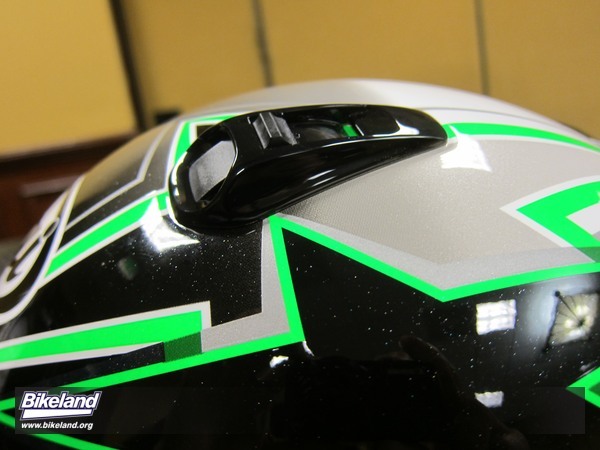 Arai Helmets previewed their latest offering to the U.S media this week announcing an aggressive new full-face model called the Defiant. Based on the popular RXQ intermediate-oval head shape, the Defiant sports an impressive array of new features and technology which promises to make it a comfortable choice for a variety of conditions. 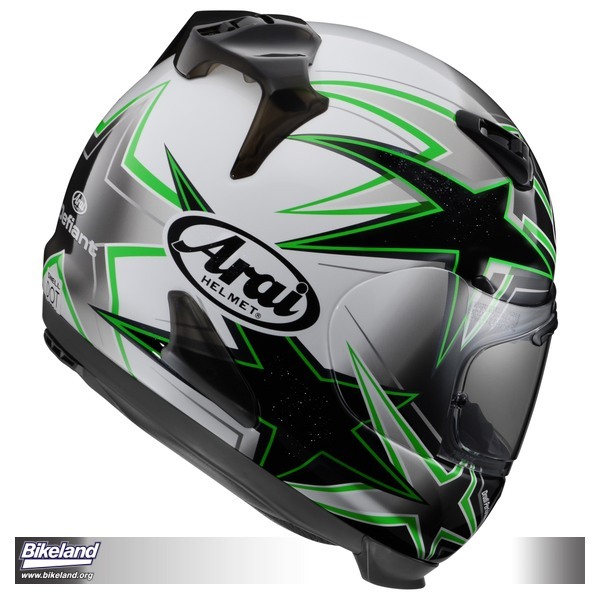 Urban guerilla graphics, colors and styling are a first for Arai and partly the result of its partnership with Ducati. 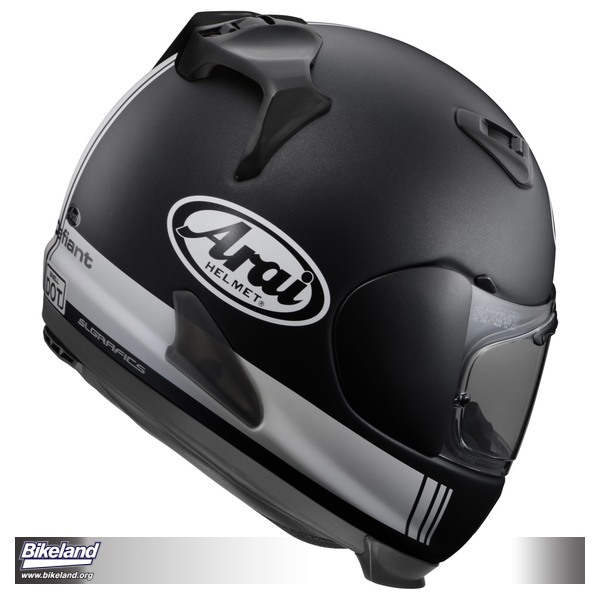 A traditional, family owned company, Arai required any foray into hip helmets retain its legendary standards for protection and innovation. 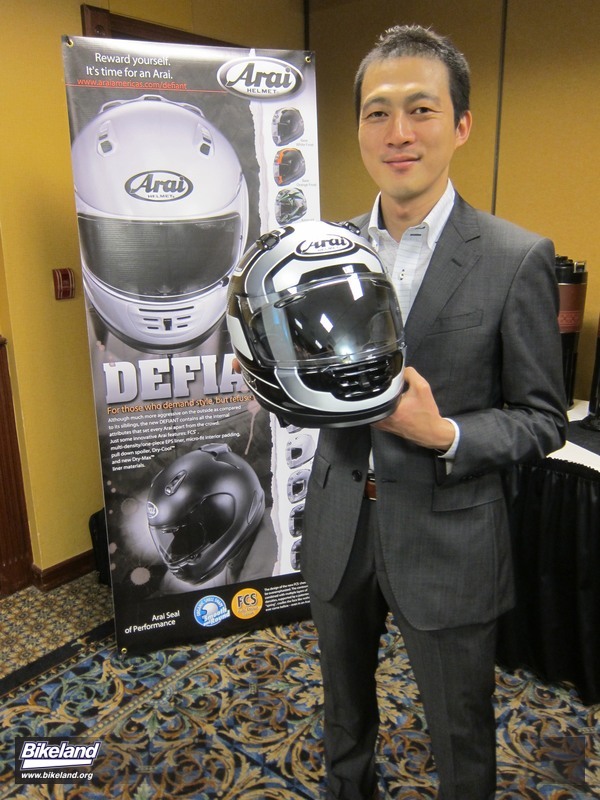 Rather than create a new model just for market infill however Arai is using the Defiant to introduce new high-end features which will probably be found on more models in the future. 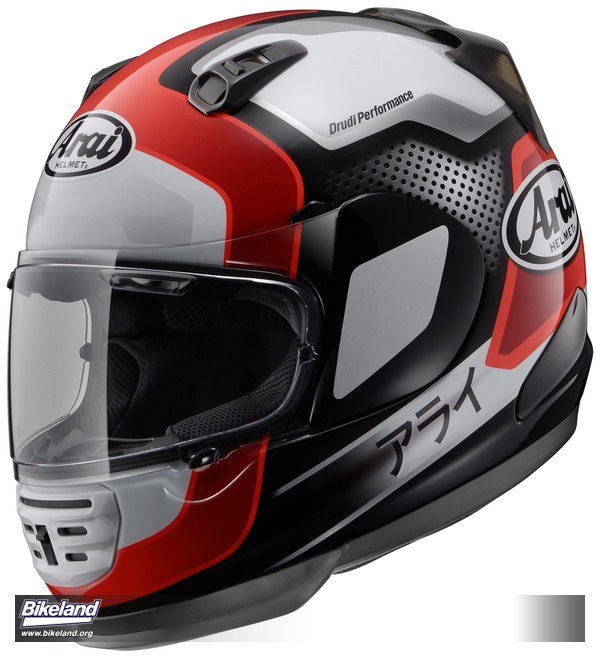 Outwardly the Defiant looks different but it’s still an Arai. 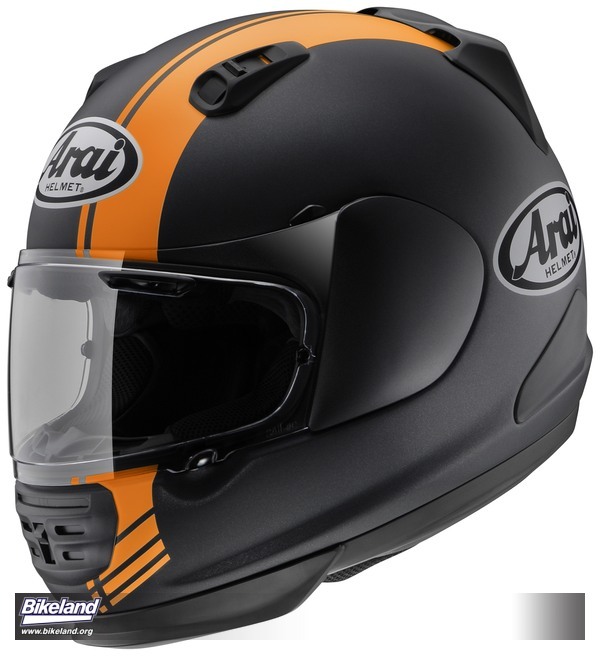 Since even the best helmets are worth little if buyers shun them due to style (or comfort) Arai has gone to great lengths with the Defiant to address styling without compromising their long-time commitment to spherical (snag less) outer shell designs. Internally, Arai has improved the unique Facial Contour cheek pad System (FCS) with new moisture management materials. A quick test fit confirms the feel is luxurious and the pad’s two stage “spring system” makes putting the helmet on noticeably easier. The pads still retain the 5mm peel away layer design that allows owners to customize the fit. The Defiant’s advanced air management features include a Moto GP-derived recessed chin vent and lower spoiler that increases down force and stabilizes airflow. The reduction in turbulence between head and shoulders reportedly provides improvements in sound reduction. The chin vent and aggressive scoops also feature large three position slide-gate air vents that look good and will be easy to adjust with gloves. The Defiant should be available in March with MSRPs from $619.95 to $759.95. We look forward to trying one and reporting our findings. Among its key features inside are Arai’s patented FCS® (Facial Contour System) cheek pad, a design so advanced the company says it combines unprecedented support and comfort, while further reducing interior noise; 5 mm peel-away cheek and temple pads micro-fit the interior to your facial contour; and the fully removable/ washable/replaceable comfort liner now features Arai’s water-repellent Dry-Max™ material on the exposed areas of the cheekpads and neckroll that prevents water absorption in wet conditions and provides a “luxurious” feel. The new IR Neckroll pad has an improved shape to flow more air to the bottom of the helmet at lower speeds for improved rider comfort. Outside, the Defiant’s new IR chinvent and front spoiler edge trim are said to offer more than just a bold look: typical of Arai, they houses a number of rider benefits. The chinvent provides multiple adjustments and functions “with tangible rider benefits,” while the edge trim is flared along the bottom, creating a stabilizing down force while reducing buffeting, lifting, and turbulence-generated wind noise. Another visual feature of the new Defiant is its larger IC-4 upper front intake vents whose slide-gate closures seal more completely when closed, allowing for a cleaner airflow. The new Defiant also has Arai’s patented Hyper-Ridge® reinforcing band, and the helmet comes standard with a clear Pinlock SAI Max-Vision faceshield and anti-fog lens insert. Defiant comes in an expanded size range from XXS to XXXL, in five solid colors and six graphic designs and colors. MSRP ranges from $619.95 to $759.95. Like all individually- handcrafted Arais, it meets or exceeds both Snell 2010 and DOT standards.